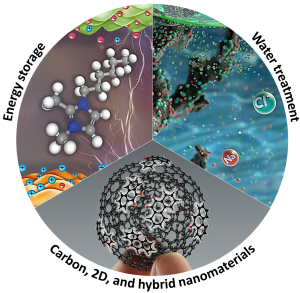 Research at the Energy Materials Group is focused on the synthesis, characterization, and application of electroactive interfaces and functional nanomaterials. Our activities focus on electrochemical energy storage (supercapacitors, redox electrolytes, batteries) and electrochemical water treatment (capacitive deionization, Faradaic deionization). Carbon nanomaterials and nanohybrids are the most important electrode materials, and we utilize non-porous carbon nanoparticles (carbon onions, carbon black) and nanoporous carbon materials (activated carbons, carbide-derived carbon, polymer-derived carbon, carbon nanofibers) to obtain electrodes for electrochemical applications. Hybridization of carbon is accomplished by implementation of nanosized metal oxides, and we also investigate Faradaic materials, such as transition metal carbides (MXene) or transition metal dichalcogenides. Redox electrolytes capitalize on the rapid charge transfer when in nanoconfined; utilized as nanoreactors, nanoporous carbons combined with redox electrolytes enable the unique combination of battery-like energy storage while maintaining supercapacitor-like charge/discharge rates. We focus on a comprehensive array of materials characterization techniques and in-situ methods to gain novel insights into electrochemical processes. Our contributions extend from basic research, materials synthesis, and the refinement of testing procedures to industrial collaboration and technology development.